Several girls were forced to drop from the second-floor balcony of a New Jersey building to escape a roaring fire that ripped through their dance studio Monday. 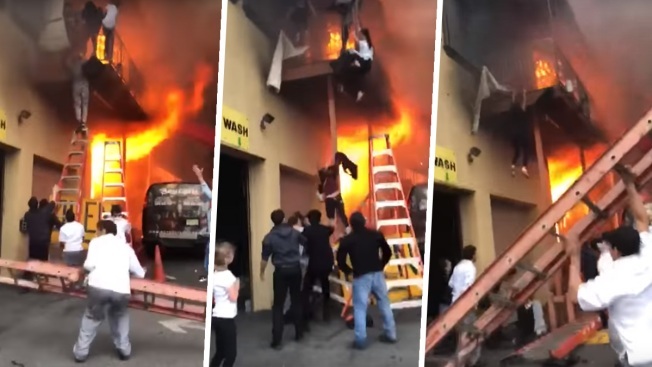 In a video posted to YouTube, a few of the girls can be seen trapped on the balcony as several people on the ground rush over with ladders to mount a rescue effort. At least one girl makes it down a ladder before it tips over. Video shows one girl clinging to the side of the balcony, legs dangling, as the men below yell "jump!" The clip ends with several of the kids piled on the ground, many walking away from the scene without apparent major injuries. "Just gotta get the girls out, couldn't do it quick enough," said Edgewater police Sgt. James Dalton, recounting the rescue. Edgewater Mayor Michael McPartland said 10 to 15 girls suffered minor injuries in the harrowing escape but no one was seriously injured. "It was one of the bravest things I've ever seen," said McPartland. The flames at the building, which also contained a car was and auto body shop, had been knocked down by Monday evening. Smoke from the fire could be seen as far as upper Manhattan at the height of the blaze. The cause of the blaze was not immediately clear, but officials believed it may have started in the restaurant.